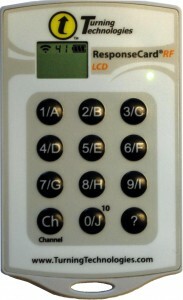 Polling, or “Personal Response Systems” (PRS), more formally known as personal response cards, are wireless handheld keypads that enable participants in an audience to answer multiple choice questions posed by a presenter using specially designed software to provide real-time results on a projected screen. The devices have proven a valuable classroom tool making lectures more interactive by providing students a more participatory role in the class, and helping instructors gauge student understanding based on the polling feedback. Some instructors use polling for peer instruction which has demonstrated improved results in student learning. Polling responses (typically multiple choice or true/false) are recorded to the instructor’s computer via a USB receiver, and can be saved for later review or to generate a variety of reports.